British jihadists who go to fight in Iraq or Syria could be tried for treason, the Foreign Secretary has suggested. Philip Hammond said such people had "sworn personal allegiance" to Islamic State (IS) and could potentially have committed the offence. The last prosecution for treason was in 1946, when the notorious Lord Haw Haw - real name William Joyce - was hanged for his Nazi propaganda broadcasts. The offence remains on the statute books, even though the death penalty has been abolished. September 3, 2014—Toronto, ON—Jason Kenney, Minister for Multiculturalism, today greeted the leader of the ancient Coptic Orthodox Church upon his arrival in Toronto, on behalf of Prime Minister Stephen Harper and the Government of Canada. Pope Tawadros II, who became the 118th leader of the Coptic Orthodox Church on November 19, 2012, arrived in Toronto this evening to officially begin his month-long Canadian visit. 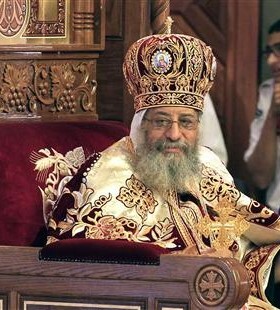 His first trip to Canada will include the consecration of the first Coptic cathedral in North America, Markham’s St. Mark's Coptic Orthodox Church, visits to other parishes across Canada, meetings with religious leaders, and the delivery of a lecture at Queen’s University in Kingston, Ontario. Andrew Bennett, Canada’s Ambassador for Religious Freedom, joined Minister Kenney in Toronto to greet Pope Tawadros. A black flag with Arabic writing, similar to the ones used by Jihadist fighters in Syria and Iraq, has been taken down from an east London housing estate by a local nun. The flag, seen on top of the gates of the Will Crooks estate on Poplar High Street, Tower Hamlets, was put up alongside Palestine flags and slogans in support of Gaza. Thousands of young British Muslim men have rallied against radical Islam amid concerns that British jihadists are fighting in Syria. An estimated 5,000 Muslims gathered in Surrey today to pledge loyalty to Britain in light of concerns over the popularity of the extremist militant group Islamic State in Iraq and Syria (Isis), and the alleged involvement of Britons. Some Muslims could be effectively excluded from becoming trustees or governors of new academies and free schools under rules introduced by the Education Secretary Michael Gove in response to the "Trojan horse" controversy, community leaders have warned. The Department for Education has inserted new clauses into the model funding agreement for academies stipulating that its governors should demonstrate "fundamental British values", and giving the Education Secretary powers to close schools if they do not comply. 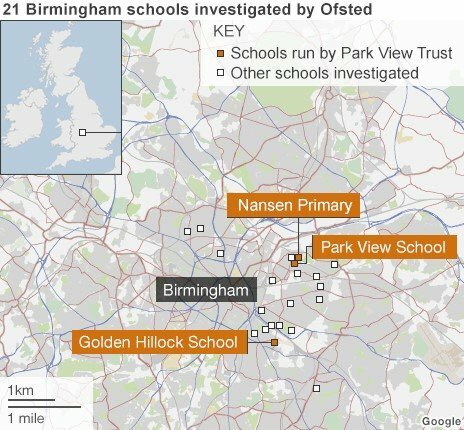 Ofsted has carried out inspections of 21 schools, following claims in an anonymous letter that hardline Muslims were trying to impose their view on a group of schools in Birmingham. Five of the schools - including three academies from the Park View Educational Trust - are being placed in special measures. A sixth school was already in special measures for its poor educational standards. This table shows the results of the new Ofsted inspection reports and the previous grade where appropriate. "A culture of fear and intimidation has taken grip" in Birmingham schools caught up in the Trojan Horse claims, says Ofsted chief Sir Michael Wilshaw. Head teachers have been "marginalised or forced out of their jobs", said Sir Michael, as he delivered his findings on claims of hardline Muslim takeovers. The Ofsted chief said there was evidence of an "organised campaign to target certain schools". Leaders of one of the schools, Park View, firmly rejected the claims. Ofsted has carried out inspections of 21 schools, following claims in an anonymous letter that hardline Muslims were trying to impose their views on a group of schools in Birmingham. The assault on Jinnah International Airport in Karachi, Pakistan’s sprawling commercial hub of 18 million people, all but destroys prospects for peace talks between the Pakistani Taliban and the government of Prime Minister Nawaz Sharif. It also deals a heavy blow to Sharif’s efforts to attract foreign investors to revive economic growth and raises questions about security at the country’s main installations. An Egyptian human rights organization is calling for a complete investigation of the case of Cyril Shawqi Ghattas, a 29-year-old Coptic Christian man who was imprisoned on the accusation of blasphemy, or “contempt of religion” (against Islam). Among other irregularities, human rights activists say that the Copt was both denied a lawyer, which is illegal, and that he was physically abused regularly during his incarceration. Cyril was arrested after he pressed “like” on a Coptic website posting on his Facebook page. There are claims secret payments were made to help the desert state win the bid for the 2022 World Cup. Former foreign secretary Sir Malcolm Rifkind has told Sky's Murnaghan programme that if the corruption allegations surrounding Qatar's World Cup bid are true it throws the country's hosting of the tournament into doubt. A former senior Fifa official allegedly paid $5m (£2.98m) in bribes to secure support for Qatar's successful 2022 World Cup bid. KUALA LUMPUR, Malaysia — The pilot of the missing Malaysia Airlines jet is believed to be solely responsible for the flight being taken hundreds of miles off course and there is no evidence of a mechanical failure or hijacking by a passenger, according to an law enforcement official involved in the investigation. A high-ranking officer attached to a special investigative branch of the Malaysia police force in Kuala Lumpur told USA TODAY on Wednesday that investigators are pressing relatives of the pilot, Capt. Zaharie Ahmad Shah, for information on his behavior leading up to the March 8 flight. The official could not speak on the record because he is not authorized to talk publicly on the investigation. The Boeing 777 was bound for Beijing when it vanished from civilian radar. 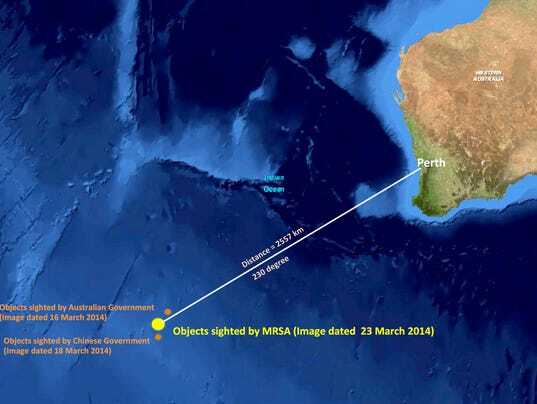 Malaysia says satellite data indicate the plane veered west about an hour after takeoff and then flew south deep into the southern Indian Ocean. (NEW YORK) — Osama bin Laden’s son-in-law, the voice of fiery al-Qaida propaganda videotapes after the Sept. 11 attacks, was convicted Wednesday of conspiring to kill Americans for his role as the terror group’s spokesman. The verdict came after about five hours of deliberation in the case against Sulaiman Abu Ghaith, the highest-ranking al-Qaida figure to face trial on U.S. soil since the attacks. The Kuwaiti imam had testified during a three-week New York trial that he answered bin Laden’s request in the hours after the attacks to speak on the widely circulated videos used to recruit new followers willing to go on suicide missions like the 19 who hijacked four planes on Sept. 11, 2001. Facing increasing pressure from Egypt and deteriorating economic conditions in Gaza, Hamas has been flirting with the notion of re-entering the Iranian camp. Now,Al-Monitor is reporting that Iranian monetary aid has officially resumed to Hamas, but at a lower level than that it provided before ties between the two broke. The report also cited a source close to Hamas' political leadership who says Iran is planning to receive Hamas leader Khaled Meshaal. Qatar was mediating discussions between Iran and Hamas in an effort to restore ties, after a two-year hiatus. Tony Blair has thrown his weight behind Egypt's government, despite it being blamed for a bloody crackdown on dissidents. Journalists have been imprisoned by the military administration of Abdel Fattah al-Sisi, which ousted elected president Mohammed Morsi in July. Morsi supporters and curbs on free speech, The Guardian reports. During a visit to Egypt, Blair said the army's intervention had been "at the will of the people" and urged people to support the government. Egypt was "an ancient civilization, a great people, great energy and determination,"